Hy Breasil is grimmer than it used to be. Before the Architect closed the door, there were regular crossings, and a great war decimated both humans and Ferishers. The native fae who refused to treat with the invaders faded; their bodies withered and died, stranding them as hungry, angry spirits that haunt the countryside. That means there’s always trouble brewing in Dorstaad. Janus Mikani and Celeste Ritsuko work for the Criminal Investigation Department, keeping citizens safe from things that go bump in the night. He’s a hardboiled cynic with an uncanny sixth sense; she’s determined to justify her promotion as the first female detective in her division. Together, they’re trying to keep a black tide from drowning the city. Bronze Gods: An Apparatus Infernum Novel by A.A. Aguirre has a lot of things going for it, a fun partnership between the two protagonists, steampunk, a good mystery, and a slice of sexual tension that doesn’t end in anybody getting dead or embroiled in a romance. The last is a good thing; it’s refreshing to see two people work together and not immediately be romantically linked. But this book has more of a Remington Steele, or the X-Files flavor to the partnership, where something could definitely happen, just not quite yet. The two are aware of their attraction, and the potential for something non-platonic, but they’ve decided that their relationship and working partnership are best as they stand, and anything else is on hold. In Dorstaad, Celeste Ritsuko and Janus Mikani, Inspectors in the Criminal Investigation Division work together. They are a good team, her organized, able to pull puzzles together with evidence, while Janus is more of a ‘goes with his gut’ and the gifts of his Fey blood. Janus isn’t all-powerful, and using his talents brings him pain, literally, in the form of blinding headaches and pain. Ritsuko is a woman in a profession that doesn’t usually welcome women, and she’s good at the ‘politics’ of the job, and she can get things done in ways that Janus can’t, and doesn’t have patience for, even on his good days. Their current case is the disappearance of a young woman, but there’s politics - she’s from one of the powerful Houses, and so there’s something strange going on. There’s magic, murder, and the case might end their careers or their lives. 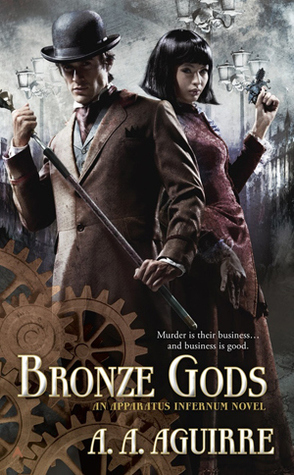 Readers looking for a purely steampunk tale or a light read won’t find that here. That isn’t to say there aren’t steampunk elements, but there’s also a bit more urban fantasy to it, with the Fey, magic, and other aspects of the story. As for the plotting and writing, it’s written for people who are willing to look for the clues, catch small details, and in short, not drift through the book or pick it up and put it down. ‘Blink and you might miss something’ is apt when it comes to the Bronze Gods, and anybody willing to put in the attention will find it rewarded.